Autoimmune disorders involve the body’s immune system mistakenly reacting to the tissues in one’s own body. They are all chronic inflammatory diseases, which often progress to more complex, systemic disorders that can affect other tissues and organs in the body. In the links at right, we will take a look at each of these disorders to better understand how the ocular surface responds in reaction to the inflammatory cascade, what the conventional clinical management practices are, and how TheraLife® can help. Everything you need to start treating dry eyes, blepharitis, and meibomian gland dysfunction. 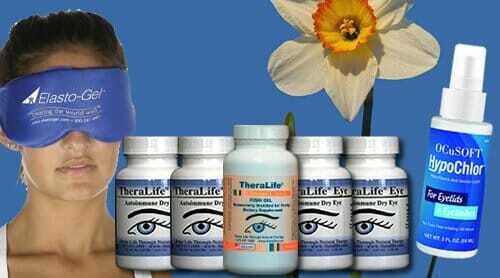 The All-in-One Autoimmune Starter Kit offers: 4 bottles TheraLife® Eye Autoimmune, 1 bottle Omega-3 Fish Oil, 1 Eye Lid Cleanser, and 1 Hot Compress. For dry eyes from Sjogren’s syndrome, rheumatoid arthritis, ocular rosacea, Graves’ disease, Raynaud’s, lupus, bone marrow transplantation, graft versus host disease, and more.